Featuring Cinphul Rat King Masks at Ironwood Hills Paranoia. Halloween came early at Ironwood Hills Paranoia Event. 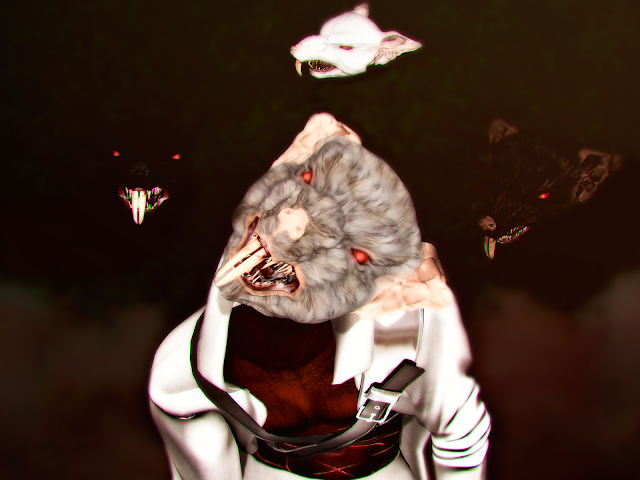 Cinphul has these fantastic creepy rat masks available at 20% sale at the event until April 30: The Rat King Masks. 4 colors available: Albino, Coal, Grease and Heather. Masks are copy/mody, resizable and eyes can be tinted and retextured. 200L per color and 520L for the fatpack. Hunt prize is a gold and silver Rat Head Nuggets. Skin: Fallen Gods Inc. by Alia Baroque - Wood Nymph. Scar Tissue Big Cat Scratch. Outfit: Gabriel by Takuya Jinn - Armor. Pose: Spartin Parx Poses by Spartin Parx - Sideshow 5.